indicating Delay & Extension Timing functions. adjust the DEFLECTOMETER® reading by using the front panel UP or DOWN sensitivity buttons. separated by at least 5 KHz avoids crosstalk problems and future service calls. three types of loop faults; Open Loops, Shorted Loops, and 25% sudden changes in inductance. loss or reset will not delete this memory. A MUST FOR TROUBLESHOOTING! 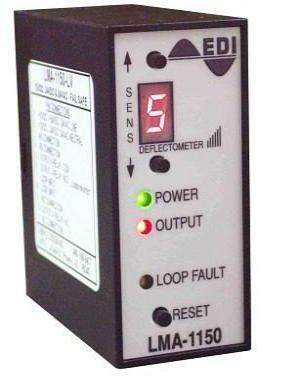 the user to set up operational parameters including frequency & sensitivity. Wide Loop Inductance Range: 20 to 2500 micro Henries.